Castaway Island Resort really does have something for everyone, from the most active to the most relaxed. Fiji’s most popular island resort has guests returning year after year to experience the magic that is “Castaway”. The island’s 174 acres are covered with lush tropical vegetation, surrounded by white sand beaches and encircled by vibrant coral reefs. The spacious yet secluded bures, creative island cuisine, along with the warmth and genuine hospitality of the Castaway family of staff combine to provide a unique holiday experience. On Castaway Island, there are just 66 individual bures of varying sizes nestled amongst the lush tropical setting or situated at the ocean’s edge. 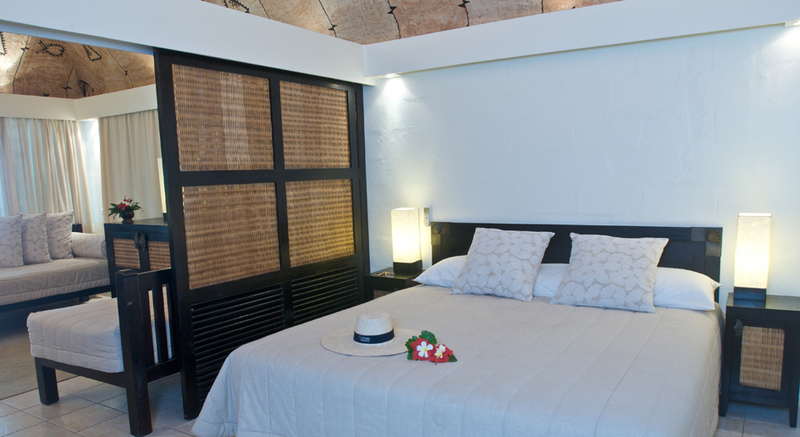 Guests are delighted at the understated natural elegance of their accommodation: distinctive natural timbers, hand painted vaulted ‘tapa’ lined ceilings and traditional grass thatched roofs compliment stylishly appointed air-conditioned interiors. The tariff on Castaway Island includes all Fijian taxes and most non motorized watersports. A meal plan can be purchased, and is usually always the best way to go. There are also options such as dinner on the beach or in your bure, or a picnic luncheon with champagne on a private beach ~ where the movie with the same name was filmed. Castaway is the perfect place to celebrate or reaffirm your marriage vows. Lovers of all ages choose to wed in a traditional and romantic South Pacific island style, while others renew their vows or honeymoon Castaway style. To celebrate a wedding Castaway style, ceremonies may be as formal as you wish, or very relaxed and informal – its your choice. Weddings performed on Castaway are legally binding and each wedding is treated with the individual care and careful attention to detail to make your day truly memorable. Most non-motorized activities on Castaway Island are available at no extra charge. The snorkeling and diving in the area is some of the best in the world. Children will enjoy the daily activities available at no extra charge. There are many other activities available for a nominal fee. Families with children are always welcome on Castaway Island.